Green tea regions in Japan: the best green tea agriculture is in the prefectures of Shizuoka, Kyoto (Uji), Kagoshima, Miyazaki, Fukuoka, Mie and Kumamoto. The cultivation of >>green tea<< has a rich heritage in Japan and a long >>history<< that begun around 800 AD. According to the tradition, the tea plant was first cultivated on the island of Kyushu (South) and then in the Uji region (Kyoto), where monks brought it from China to Japan. For a long time, only the nobility and upper echelons of society drank green tea; it was not until the Meiji Restoration at the end of the 19th century that the cultivation and consumption of green tea became widespread in Japan. Like no other country in the world, modern Japan has developed the most advanced and refined industry for the cultivation of a few varieties of green tea. Furthermore, it is the second largest green tea producer in the world after China. The quality and growth of green tea greatly depends on the climate, as well as the condition and fertility of the soil in the respective region. The tea plant – otherwise known as Camellia Sinensis – is a subtropical plant that is not resistant to cold, required lots of rain and sun, is sensitive to waterlogging and loves areas in which there is a clear difference between day and night temperatures. For this reason, almost all green teas flourish in around 20 regions in the southern half of Japan. The best quality for health is achieved in high-altitude regions with a bracing climate, in which the tea plant grows slower but creates richer ingredients, as is the case in many medicinal plants. 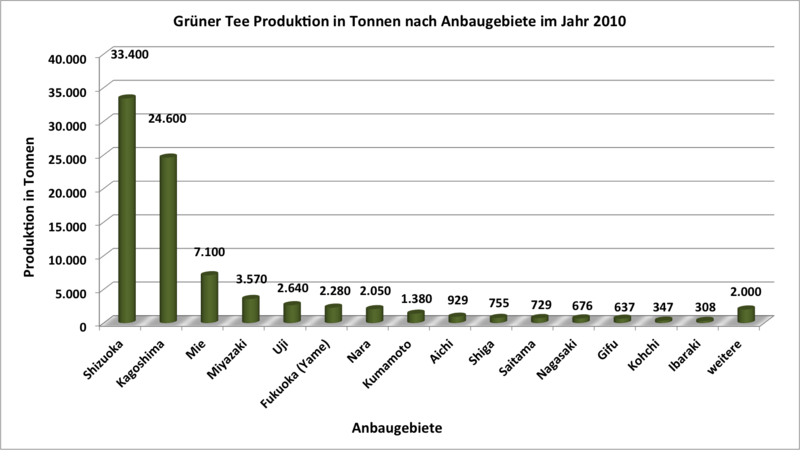 The following infographic shows a comparison of green tea production inside the individual regions of Japan from the year 2010. From approximately 83 thousand tonnes of the 2010 harvest, about 40% originated from the main cultivation region Shizuoka, west of Tokyo. The second centre is the large island of Kyushu, which lies in the Southwest and has a relatively mild climate. The other well-known tea regions in Japan – Kagoshima, Miyazaki, Yame/Fukuoka etc. – account for about 30% of production, of which 27% is from Kagoshima alone. This map gives an overview of the main regions of green tea cultivation. The most well-known areas are shown in dark green. All green tea lovers should know about Shizuoka, since this prefecture – almost in the centre of the country – is the largest producer of green tea in Japan and one of the proudest tea regions. The prefecture lies on the southeast coast of the main island of Honshu, and stretches almost 160 km from East to West. Almost 40% of the total Japanese tea production comes from this region. Situated close to important ports, Shizuoka has a very hilly/mountainous landscape with a distinctly fresh and invigorating climate, generally mild temperatures, excellent water quality and a good amount of rainfall for green tea cultivation. In Shizuoka, the spring begins relatively early and the winter is somewhat mild. The region leads the production of Sencha and Sencha Fukamushi, however produces many other high-quality green tea varieties: a very good Shincha and a solid Gyokuro (after Uni, Yame and Mie). A special landmark is the volcanic Mount Fuji “Fujisan” (3776m), at the foot of which high-quality green tea is grown. The mountainous and volcanic island of Kyushu (9th Province) in southwest Japan, is the third-largest island and has a subtropical climate. With about 27% of Japanese green tea production coming from Kyushu, the flatter prefecture of Kagoshima accounts for the bulk of Kyushu’s total production (approx. 30%). For a long time, Kyushu had a somewhat lower reputation than Shizuoka or Uji for its Sencha; in recent years, however, it has significantly improved its quality and is now marketing top-quality teas. Important tea areas in Kyushu are Kagoshima, Ureshino, Yame, Miyazaki and Fukuoka. Kagoshima is the second biggest tea growing prefecture in Japan after Shizuoka. Located in the South, the tea fields here are relatively flat and very well structured – thus best-suited for mechanical harvesting. As a result, Kagoshima has been able to significantly expand its productivity in recent years. The best regions for producing particularly high-quality Senchas are Chiran, Kirishima and Shibushi. All the important information and tips about the best terroirs, varieties and cultivars can be found in the article >>Green Tea from Kagoshima<<. This prefecture in the southeast of Kyushu is mainly known for its very good Sencha, but also for Fukamushi Sencha, Tamaryokucha and Kamairicha. The Oolong and black teas are also very famous there. Miyazaki has developed well in recent years, emulating its neighbour Kagoshima. The most famous area for Sencha here is Miyakonojo, which lies in a special geographical basin with its own microclimate. The northern towns of Gokase and Takachiho are most famous for Kamairicha, Oolong and black teas. Detailed information can be found in the article: >>Green Tea from Miyazaki<<. The small region of Yame, located in the prefecture of Fukuoka, is famous for its outstanding Gyokuro. Only Gyokuro from Uji matches the superior quality of that from Yame. The Gyokuros from both regions however bring out completely different taste notes and thus complement each other perfectly. The prefecture of Mie is located on the main island of Honshu in the region of Kinki. Mie is the third biggest green tea growing region in Japan. The area is famous mainly for its half-shaded Kabusecha tea, as well as for its high-quality Sencha. Plus, very good Gyokuro is grown here. Mie has a long and rich traditional history of tea agriculture. Uji is a city in the prefecture of Kyoto, south of Kyoto city. While it is a relatively small area of cultivation, producing only 3% of Japan’s total green tea production; it is world famous for its outstandingly fine quality. The majority of Uji teas are shaded, such as Gyokuro and Tencha for Matcha. Uji is considered the cradle of Japanese green tea and it was here that the production process for Sencha was invented (Uji method). Centuries ago, the Uji district supplied the famous Emperor’s tea and today it supplies the world market with the most prized Japanese green teas: Gyokuro, Matcha and the best Senchas. From these varieties, the highest Japanese qualities are produced. The best Senchas are produced in Ujitawara and partly also in Wazuka, and likewise the best Matchas and Gyokuro, in Tanabe, Ogura and Chino Shirakawa. Nishio located in the prefecture of Aichi – with its mild climate, fertile soil and humid air from the river Yahagi – is the ideal cultivation region for the green tea variety Tencha. Since the much sought-after tea powder Matcha is extracted from Tencha, it is one of Japan’s largest and best agricultural areas for Matcha, with an annual production of about 290 tons (about 25% of Japan’s Matcha production). Only about 1% of Japan’s total green tea production is grown in the Aichi region.